Test course is in Miyoshi city Hiroshima Japan. There is flat and straight road. The distance is about 2km. Each to and back ways have two lines. Width of course is enough wide to play catch. We can measure the speed of car at regular intervals. We can measure the temperature , humidity and the velocity of the wind. We can use this course only in holiday. The test car is accelerated to about 40km/h. And after cutting off the engine , the car run straight. The speed at cutting off the engine is setted by concerning of race speed. Test driver must not steer for the data reappearance. The measured data are plotted on the glaph whose cross axis means the square of speed ,vertical axis means the deceleration. The straight line is drawn with least square method. The value at zero speed means the rolling resistance. The slope of line means the air flow resistance. We concern the resistance at 25km/h ( f25 [N] ) too. The theory of analysis is simply discribed as follows. D[m/s^2] :Deceleration of the car is discribed as Eq.1. 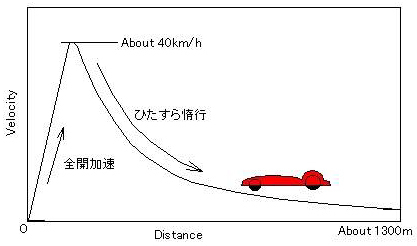 Here V[m/s] :The speed of the car , S[m^2] :Front projection area , Cd :Air flow resistance coefficient , Sigma [kg/m^3] :The density of the air. 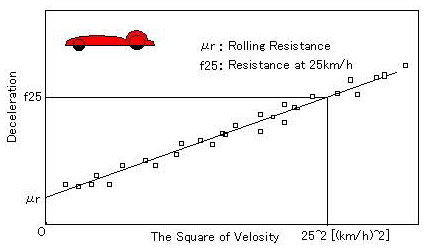 Rolling resistance Fr is described as Eq.5. Here , μ : Rolling resistance coefficient. The deceleration is appeared as Eq.6 from Eq.1,2,5 . We can estimate the Air flow resistance coefficient and rolling resistance coefficient. But we must concern the speed of car. The acutual air flow resistane coefficient and acutual rolling resistance coefficient is changed when speed is changed. When we compare the resistance between other condition, we must select the data to set the same speed.